The first comparison Ilko makes is with the 85 mm lens. He places them on a crop body first, the Canon EOS 70D, and then on the 1DX, which has a full frame sensor. The settings are the same for both shots: aperture is wide open at f/1.8, ISO 100 and shutter speed 1/640. The distance between him and the model was the same as well. The next two camera-lens combinations to test include the 135mm lens on the full-frame and the crop body. Ilko starts off with the Canon EOS 70D. As this lens has f/2.0, he decreases the shutter speed for one-third of the stop to balance the settings with the previous shots. So, it’s f/2.0, ISO 100 and shutter speed 1/500. I’m guessing you already know the difference between the crop and the full frame sensor in theory. But this comparison is a very practical and straightforward way to see and compare the results given by these lenses on different cameras. 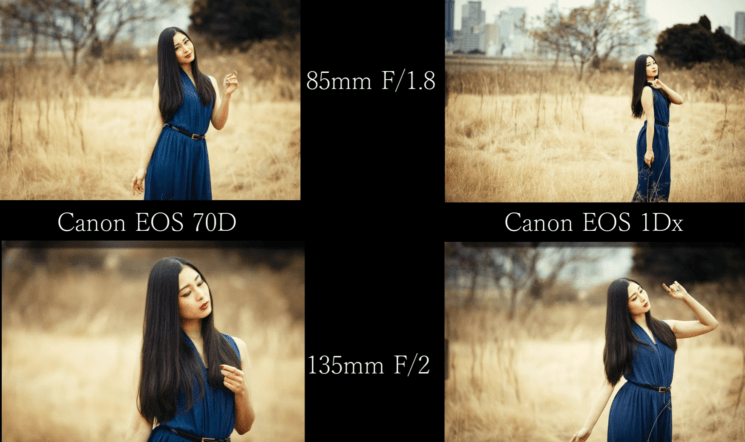 So, will you opt for a crop or a full frame camera? Do you think the differences are significant in the third comparison? You can’t have two decimal points, that that’s impossible. In other countries, they swap the decimal and comma, so I’m guessing jet may be from one of those countries. Why don’t use same lens but crop the photo (full frame body one)? Compare with two photo, the result will look like same. The 3rd testing is no not helpful. Why don’t use same lens but crop the photo (full frame body one)? Compare with two photo, the result will look like same. The 3rd testing is not helpful. Is that déjà vu or paramnesia? Changing two or more things in an A/B test invalidates the results. It is such a shame that critical thinking skills and basic experimentation methods are no longer valued. Please stop saying the FOCAL length changes when it clearly does not. It is the ANGLE OF VIEW that changes. The woman in the 70D images is so much larger… that must be the better camera! Been following this youtuber for a couple of months. Just watched this video yesterday. He should do more english vids though. It’s the same focal length!, the lens doesn’t change…the sensor just sees less of the same image ? Crop for the enthusiasts, full frame for the pros (well, at least in many cases). I can live with that. That’s not the end of the day though for crop sensor owners, just adjust your distance with the model and (if able) the model with the background, and you can achieve pretty much 90% of the bokeh on what FF cam can do. Of course with FF you can achieve bokeh easier, but if on the budget, crop sensor can do it too. If crop-sensor could perform even close to FF then why would companies make FF? No, just, no. Stop repeating this idiotic statement. The focal length does not change. You just get a smaller picture with a smaller sensor. He should have added “equivalent” so shoot him. Hence the use of 135mm to compare. The 85mm on a cropped sensor produces the same or similar results to a 135mm on a full frame body, all other things being equal. I hate it when people are so technical they can’t see the forest for the trees. Sure, Full Frame is better, but if you want to zoom with any kind of magnification, it’s gonna cost alot more on the full frame than it will the Cropped. And the lenses are more with FF. And in general the costs are more with the FF. So, it comes down to budget. The greatest difference between these is the softness of the background between the 85 and 135 lenses. The 135 produced a softer BG than the 85 when shooting the subject at the same distance (the same composition essentially from the two different lenses and body combinations). This is as expected but helps show why use one format over the other. One note, I noticed he changed lenses with the camera body in the grass! A great way to get crud and crawlies inside the camera!